When it comes to roasting chicken, no oven comes close to the flavor of the grill. Use half chickens. Half chickens maintain the same juiciness and flavor of a whole chicken while also allowing for a more even cook and seasoning. Start your pit at least 30 minutes before you start smoking your chicken. You want the charcoal to turn to gray. Season your chicken. Place each chicken half breast side down on a clean sheet pan. Lightly season your entire chicken, ensuring you season under the wing and leg. Flip the chicken over so the breast side is up, and lightly season the top side of the chicken. After seasoning, tuck the chicken wing back and under on each chicken half. Experiment with different types of rubs, seasonings, and marinades to give your chicken even more flavor. To re-create the Smokey Mo’s flavor at home, use the Smokey Mo’s Spice Rub. Another simple start: lemon juice, olive oil, rosemary, and garlic. Let the seasoned meat sit in the refrigerator for at least an hour before grilling. Check the temperature of the grill. You want the grill to be between 225°F and 275°F. If your cooking area is close to the charcoal, you’ll want to be on the lower end of the temperature range. Lay the chicken directly on the grill, over the side of the grill without charcoal for indirect heat cooking. Close the grill to retain heat and smoke. Cook for about one hour, and then spray each half with fat. We like duck fat, but you can use any cooking spray. This will help the chicken skin get nice and crispy. Applying the fat too early can cause the skin to get too brown or to burn. Cook for another 30 minutes, or until the internal temperature of the chicken reaches 165°F. Always temp your chicken in the thickest part, either the breast or the joint of the dark meat. Remove the chicken from the grill and let it stand for about 10 minutes to let the juices settle. Slice and enjoy! 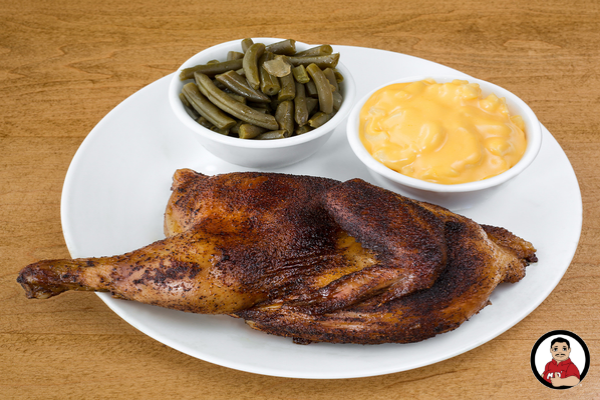 At Smokey Mo’s, a question we’re sometimes asked is, “Why does the smoked chicken look pink on the inside?” That’s understandable! We’ve been taught that seeing pink in chicken means it’s not fully cooked. But when you’re smoking the meat “low and slow,” a pink tinge is normal. Even when all parts of the chicken have reached a temperature of 165°F, you may see a pink-colored rim about a half inch wide around the outside of the cooked meat or close to the bones. The scientific explanation is this: A protein stored in the muscle and bone marrow of the chicken, called myoglobin, is a purplish color. Under normal cooking conditions, this protein breaks down to give the whole piece of chicken a consistent white coloring. However, the gases released by smoking meats combines with the myoglobin and create a pinkish color that will not fade, no matter how hot you cook it. This reaction is what gives the “smoke ring” to most meats. Since there is also an abundance of myoglobin in the bones, you may also see this pink color concentrated around the bones and joints. Link here to see what the USDA says about the color of meat and poultry. But rest easy. At Smokey Mo’s, we temp all of our meats to ensure your health and safety. Time for a break from spring grilling? Visit Smokey Mo’s! Order up a half chicken, which includes a breast, a wing, and a thigh. Our chicken is smoked over oak wood and covered in a dry rub spice – for just the right blend of tender meat and succulent flavors.